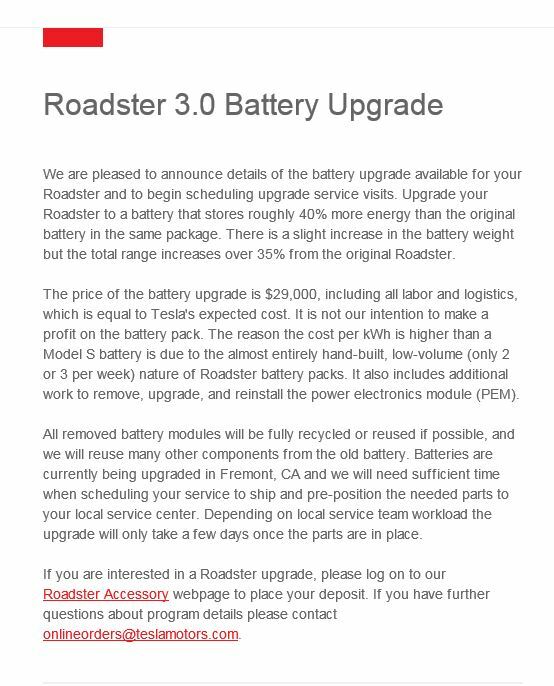 Tesla Motors released more information about the Roadster battery upgrade in an email sent to owners today. The new battery pack will have 40% more energy than the previous version, but it will be heavier therefore allowing a 35% increase in range. The pack will be hand-built at low volume and Tesla doesn’t aim at making a profit on the upgrade, which will cost $29,000 including labor. Tesla originally announced the upgrade late last year. The original announcement mentioned a potential range of 400 miles with not only a new battery pack, but also better aerodynamics and tires. The new information released today makes no mention of the last two. Tesla sold roughly 2,400 Roadsters during its original run between 2008 and 2012. It will be interesting to see how many owners will choose to upgrade the battery pack, but apparently the company is not expecting a lot of takers with a planned production of only “2 or 3 per week”. At this rate, it would take 3 years just to replace 20% of the battery packs.